Students from the University of Southampton have designed a six-foot long cyber rhino as part of Marwell Wildlife’s Go! Rhinos campaign, which will see a spectacular trail of colourful and creative sculptures in the streets and parks of Southampton this summer. Erica the rhino has been designed and built by Electronics and Computer Science (ECS) staff and students at the University of Southampton. 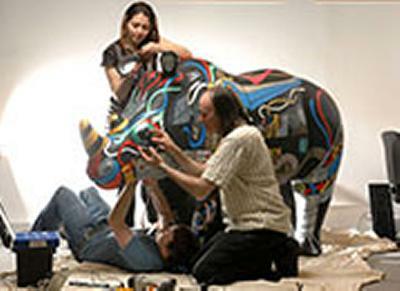 The state of the art rhino, which has been decorated by a student from the University’s Winchester School of Art, can move her ears and eyes, change her mood and even tweet. Using small low power computers Erica, a fibreglass sculpture, can respond to nearby people and even has her own WiFi network so the public can interact with her via smart phones. Erica is currently being customised with digital features including LED lights to help her blink and adjust to focus on her fans, read QR codes and move her ears. Erica tweets, reads tweets and her various Raspberry Pi computers, created especially for schools and hobbyists, will interact inside just like web servers in the World Wide Web. Erica even has a specialist “brain team” who have made it possible for her to learn about her environment and provided her with both short and long term memory. The short term memory enables her to react instantly to an action, while the long term memory recalls accumulated actions so that her mood and behaviour can change throughout the day. The people of Southampton will be able to visit Erica in the Marlands Shopping Centre during the summer months and improve her mood by “feeding” or tweeting her or interacting with their phones. Go! Rhinos is a mass, world-class public art exhibition brought to the streets and parks of Southampton by Marwell Wildlife. From the 13 July until 22 September, rhino sculptures will trail all over the city, demonstrating the artistic talent that Southampton has to offer. Although Erica is still being digitalised you can follow her journey on Twitter, Instagram and through her blog.